The USB 3 capable Lightning port on Apple's iPad Pro could use an incoming charge of up to 29 watts, matching the abilities of Apple's 12-inch MacBook. But without any USB 3 Lightning cables yet available on the market, this power remains untapped for now. 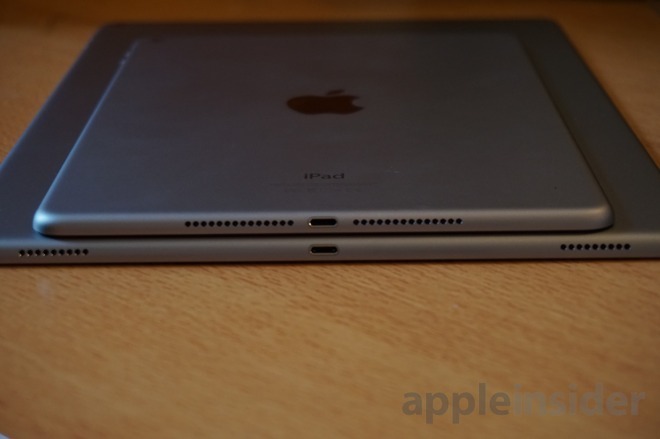 iPad Air 2 (top) offers USB 2 speeds, but the iPad Pro has a USB 3 controller. 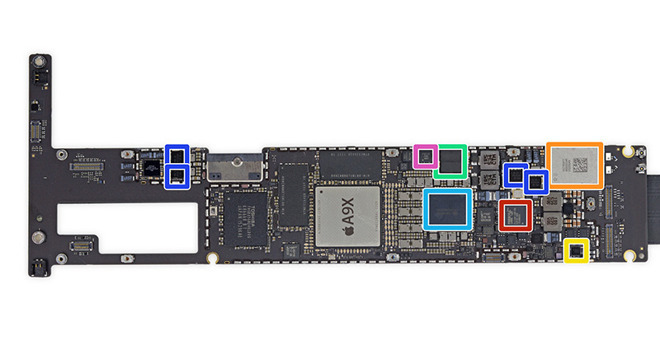 Buried within the hardware regulatory information for the iPad Pro, it's revealed that the 12.9-inch tablet can use 14.5 volts at 2 amps, which is equivalent to 29 watts. However, the iPad Pro only ships with a 12-watt power adapter. Apple already ships a 29-watt power adapter with its 12-inch MacBook with Retina display, but the thin-and-light notebook charges over a more capable USB 3 cable with a USB-C port. A representative from a major Apple-authorized accessory maker confirmed to AppleInsider this week that Lightning-to-USB-C cables do not meet the iPad maker's current requirements. The Lightning cable that ships with the iPad Pro, however, is limited to a load of 12 watts, and it features a full-size USB Type-A 2.0 port on the opposite end, not a USB-C connector. Currently, there is no way to directly charge an iPad Pro with Apple's 29-watt MacBook power adapter. That's because there aren't yet any sanctioned USB 3 Lightning cables available on the market. Apple isn't even allowing third-party manufacturers to make Lightning to USB-C cables that would allow charging and syncing an iPhone or iPad directly to the 12-inch MacBook. A representative from a major Apple-authorized accessory maker confirmed to AppleInsider this week that Lightning-to-USB-C cables do not meet the iPad maker's current requirements. The untapped faster charging capabilities hidden within the iPad Pro are thanks to the inclusion of a Fresco Logic FL1100 USB host controller, which can deliver USB 3.0 "SuperSpeed" bandwidth to four separate ports. To date, Apple has only released one USB 3 Lightning accessory: an SD card reader that offers faster transfer speeds on iPad Pro. There is not yet an authorized Lightning to USB 3 cable that can offer faster syncing or charging, however. Faster charging is of particular interest with the iPad Pro considering its massive 38.8 watt-hour battery, which is split into two cells. Tests conducted by ArsTechnica found that it takes four and a half hours to fully recharge an iPad Pro with the default 12-watt power adapter and USB 2.0 Lightning cable. In fact, the battery in the iPad Pro is nearly the same size as the 39.7 watt-hour battery in the 12-inch MacBook. In contrast, the iPad Air 2 battery is 27.6 watt-hours. Even if a manufacturer were to make an unauthorized USB 3 Lightning cable, it's possible the iPad Pro would still restrict the charging to 12 watts, as power input is defined by the device itself. It's possible that a firmware update could be required to take advantage of the USB 3 capabilities. And using unsanctioned USB cables for charging is highly inadvisable. Still, one thrill seeking user on the MacRumors forums connected their iPad Pro with USB 2 Lightning cable to a USB-C to USB adapter, and found the charging time wasn't any faster. "I assume this is because of the limitations of a USB 2 cable," user 'Brookzy' wrote. "But with the Pro having a USB 3-compliant Lightning port, I would bet it would charge faster with a USB 3 Lightning cable."